Ryan Cannell meets Ewoks, mutant spiders and naked men riding bicycles at the inaugural Afrika Burns Art Festival in the heart of the Karoo, and discovers an event with a future. As if in a TV dream sequence, the air shimmers with a haze of intense heat and I find myself before a massive desert expanse. It's morning but already the sun glares down at me with an accusatory stare like that of my old school principal. 'You bloody rubbish', he would have said, and I would have sweated like I am doing now. Thankfully a soft breeze pushes away the heat and I feel safe behind my shield of factor 100 sunscreen. Tiny lizards run pretty patterns into the sand at my feet, and in the distance, mountains paint a striking landscape into the light blue canvas. It is a moment of perfection. Then I remember that I am still sitting on a crudely built box fitted with a toilet seat and placed over a deep hole in the ground. It is not actually too bad a way to conduct the daily business. Behind me, erected upon the barren plains of the Karoo, is the haphazard settlement of 'Tankwa Town', a community that has come into temporary existence. It is a place of magic, a blend of fantasy and science-fiction. If I were a neo-gypsy of a post-apocalyptic future, I would imagine my encampment to look like this: a huge circle of varicoloured chaos, tents and shade materials bordering an empty space where weird and wonderful structures spontaneously jut out of the hot sand. It is exhibition of randomness, or perhaps a celebration of it. Within the circle, a large star of crossing poles - apparently an oversized tumbleweed - stands firm while disturbing eyes stare out from LCD screens that hang from ten metre high protuberances. On the other side a red dome of crisscrossed wood resembling at once a gargantuan sea urchin and a mutant spider, looms over the thatched shape of a woman supine. Throughout the day I amble through this surreal reality. A giraffe-man wheels an ice-lolly stand. A naked man rides a bicycle (carefully). Two people roll by, walking in a contraption that looks like two large hamster wheels joined by a pole. I am given ice by a bald man with long dreadlocks of the beard (beardlocks? ), watermelon by a fairy, and an ashtray by an Ewok. In one tent, a DJ plays for a pixie woman who dances like a snake. In another I am offered massages and healing among masses of pillows, and treated like an Oriental prince. The sun begins to set and my focus shifts to the centre, where a fire blazes. It is the first of many. A post box scarred by the words 'post your fears' burns orange and angry; flaming whips crack the nascent night, fuelled by the posted dread. In fanciful costumes and with faces painted, like some mysterious and unknown tribe, the festival-goers and I dance together in celebration of the flames that we have come here to see. This is Afrika Burns. One legend, and there are many, tells of a heartbroken man who long ago on a far off beach constructed a large wooden image of his lost love's new boyfriend and set it alight, either in the hope of releasing his emotional pain or to evoke some type of Voodoo magic. Drawn by the flames, a crowd of moths and people gathered, and were spontaneously overcome by music and dance. 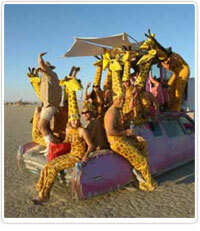 This became the inspiration for the Festival of the Burning Man in the Nevada desert. Besides being about burning things, the festival opposed the rampant Commercialism of the world, by embracing the Gift Economy; no commercial vending was allowed, but giving was encouraged without expecting anything in exchange. No specific entertainment was organised by the festival, but the participants were encouraged to contribute to the community in any way. Sound equipment and musical instruments were brought along, while stages and dance floors were built, all by the festival-goers for the sake of that transient community. Afrika Burns is a direct descendant of this, and witnessing the incredible involvement of so many South Africans, I can't help thinking that it is a beautiful success. The burning is over, but still the night is young. As the moon ascends the heavens, I head over to a dance tent where Toby Two Shoes plays his Balkan beats, and the final hours of the festival are honoured by tramping feet and a sense of connectedness that would make that heartbroken fellow and his burning man proud.